Our partners at the Kids In Need Foundation (KINF) will be organizing an effort to raise funds and in-kind product donations for students and teachers impacted by the devastation of Hurricane Harvey. The great people who run the Kids In Need Foundation have extensive experience in giving this type of support. In fact, their efforts after hurricanes Katrina, Rita, and Wilma led to the creation of their Second Responder® program. The Second Responder program is dedicated to providing much-needed school supplies to students following natural disasters like Harvey. 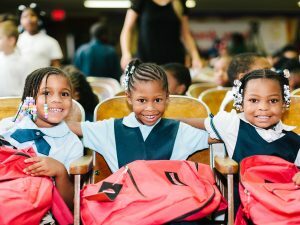 While the main focus right now for first responders is to provide initial relief with necessities like food, water, and blankets, KINF will work with local officials and schools to ensure that kids in need of supplies for this school year receive them when the time and place are right. We are so proud to partner with such an amazing organization that does so much for students in need! For those interested in helping, KINF will set aside any product donations until a deployment plan is in place. To make a financial donation, check the KINF’s Second Responder relief page.